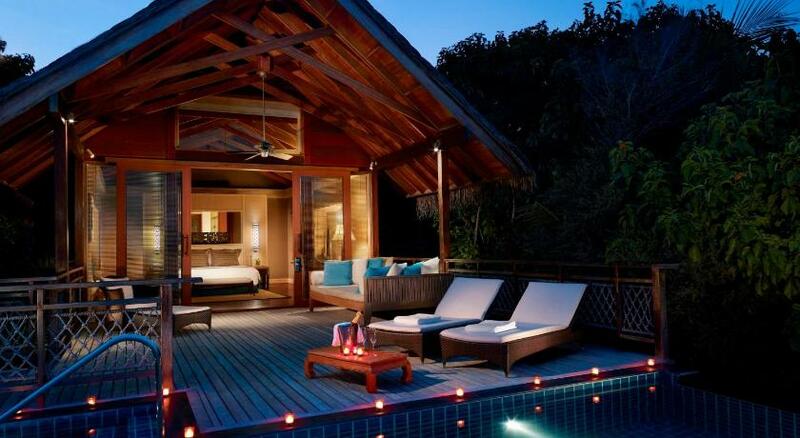 An exclusive all villa resort and spa, Shangri-La’s Villingili Resort & Spa is perfectly located in the Maldives. To preserve the foliage, this airy and boutique-styled resort is built around large trees including aged banyan trees. A variety of innovative spa treatments and activities are available to both energetic and leisure seeking clients. The villa enjoys ample space and the resort provides the opportunity to take part in a vast selection of activities such as walking through the resort’s jungle, diving in the lagoon, jogging along the beach, following jogging trails, and exercising at a well-equipped gym. The hotel provides a variety of dining options. Dr Ali’s Restaurant, for example, offers cookery of the Indian Ocean, the South China Sea, and the Arabian Gulf. Shangri-La’s Villingili Resort & Spa also offers four excellent bars and lounges with a good atmosphere, perfect for relaxing and revitalizing. Nestled in a breathtaking area of Maldives, this resort can create memories to last a lifetime. Offering a private pool, it overlooks Shangri-La’s Villingili Resort and Spa’s lush vegetation and features a terrace and open-air shower. Offers sea views from the infinity-edge pool, sundeck and open-air shower. Bigger than most in MaradhoofeydhooOffering direct access to the beach, the villa features a large patio, sun terrace and private infinity pool. Each bedroom has a bathroom with both indoor and outdoor shower facility.